To see full details of this solution, click here. Stephanie – Mitochondrial Cytopathy Requirements: • Be able to voice control her bed (Tempur-Pedic with Reverie RC-WM-101 (433mhz) remote). Solution – High Level: • Designed a microcontroller based Voice Activated solution that provided the desired functions of Head Up, Head Down, Feet Up, Feet Down, Massage On, Massage Off. 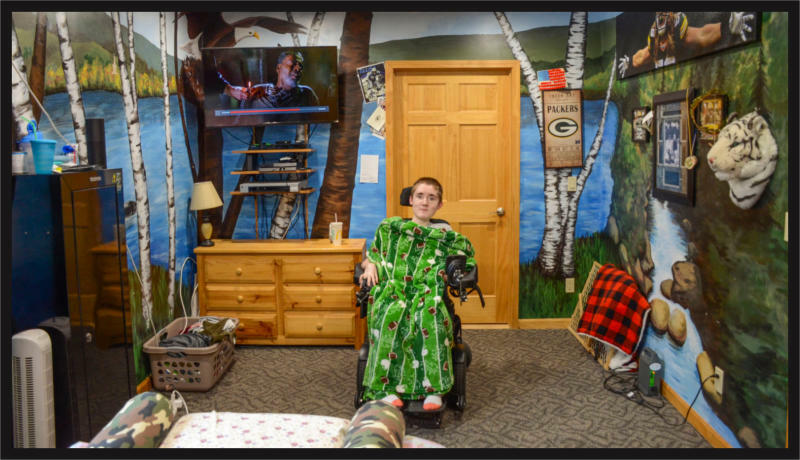 Michael Currier – Quadriplegic from Vehicle Accident Requirements: • Be able to voice control his bed (Invacare model 50001VC with 1115290 pendant). Solution – High Level: • Designed a microcontroller based Voice Activated solution that provided the desired functions of Head Up, Head Down, Feet Up, Feet Down, Raise Bed, Lower Bed. Sloane – Multiple Sclerosis Requirements: • Be able to voice control her bed (Leggett and Platt s-Cape with Raven industries control/remote KSMBR20543T). Solution – High Level: • Designed a microcontroller based Voice Activated solution that provided the desired functions of Head Up, Head Down, Feet Up, Feet Down, Flat and MR.
Greg Anger (Cerebral Palsy) and Rebecca Anger (Quadriplegia from post-viral infection) Requirements: 1. Be able to voice control their door 2. Be able to voice control their Flex-A-Bed Solution – High Level: 1. Designed a microcontroller-based Voice Activated solution that enables Rebecca to open their door hands free. 2. Designed a microcontroller-based Voice Activated solution that enables them to voice control the 6 functions of their Model FLEX185 Flex A Bed Hi Low Queen Adjustable Bed. (Head Up, Head Down, Feet Up, Feet Down, Lift, and Lower). Robert - ALS Requirements: 1. Be able to voice control his Serta Motion I Series bed 2. Be able to voice control his TV Solution – High Level: 1. Robert installed an Amazon Echo. 2. Limited Mobility Solutions started down the path of designing a voice activated bed controller for Robert’s Serta Motion I Series bed, but then discovered a solution from Ergomotion, the maker of the linear actuator control system in this new bed. They are among the first to offer an Alexa Dongle that plugs into the bed that provides voice support. 3. Robert installed a Logitech Harmony Hub and after enabling the Alexa skills he now can control his TV by voice. Mike Loftus – Primary Progressive MS Requirements: 1. Be able to voice control his bed (Invacare bed with 1115290 pendant). 2. Be able to voice control lamp next to bed 3. Be able to voice control heating blanket 4. Be able to turn off bedroom TV by voice before going to sleep 5. Be able to fully voice control living room TV 6. Be able to make phone calls via voice Solution – High Level: 1. Designed a microcontroller-based Voice Activated solution that provided the desired functions of Head Up, Head Down, Feet Up, Feet Down, Raise Bed, Lower Bed. 2. Installed (3) WeMo mini smart switches to give Mike voice control of his Lamp, Heating Blanket, and TV (For the bedroom, the only necessary control of the TV was to power it down at night) 3. Installed a Google Mini, Google Chromecast, and a Logitech Harmony Hub to give Mike the ability to voice control his living room TV 4. Phone calls can be made with Google Home. 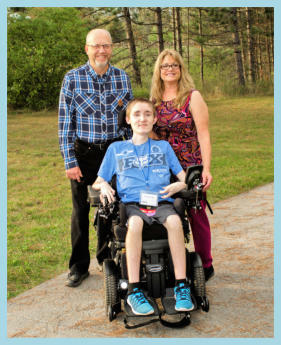 George Gregory – Duchenne Muscular Dystrophy Requirements: 1. Be able to voice control his Drive bed 2. Be able to use voice for making phone calls and have his phone number on receiving caller ID 3. Be able to voice control the ceiling lights 4. Be able to voice control his TV/Netflix/YouTube Solution – High Level: 1. Designed a voice activated bed controller which gave George the ability to control all desired functions of his adjustable bed. 2. Set up Google Home Mini so George can use voice commands to call people in his Google contact list and they will know he is calling because we configured Google Home to show his cell number on their Caller-ID 3. Installed 2 Lifx Mini (A19) Wi-Fi Smart LED Light Bulb, which are dimmable and can change colors. 4. Installed an Amazon Fire TV Cube so George can voice control his TV/entertainment. Dominic – Disabled Army Vet - Quadriplegic Requirements: 1. Be able to voice control his Tempur-Pedic Ergo bed Solution – High Level: 1. Designed a voice activated bed controller which gave Dominic the ability to control the four desired functions of his adjustable bed. He can control the bed using Alexa. We will add a Google mini in the near future. Lexi – Quadriplegic from Motor Cycle Accident Requirements: 1. Be able to use voice commands to control her semi-electric Invacare bed Solution – High Level: 1. Designed and provided a voice activated bed controller so Lexi could control her Invacare bed using voice commands. Steven – Progressive MS Requirements: 1. Be able to voice control his Drive bed 2. Be able to voice control the lamps in his bedroom and living room 3. Be able to voice control two TVs/Amazon Prime, Sling TV Solution – High Level: 1. Designed a voice activated bed controller which gave Steven the ability to control all desired functions of his adjustable bed. He can control the bed using Alexa and Google 2. Installed two WeMo Smart Mini switches so Steven can control both lamps 3. Installed two Amazon Fire TV Cubes so Steven can voice control his TV/entertainment. Copyright  2019 Limited Mobility Solutions Inc. Website by North Country Website Design.